The “sugar” game in the College World Series that was scheduled for the night of June 29th. had to be re-scheduled for the following day due to inclement weather, and the crowd that was able to stay for the game the next day at noon was much smaller than the ones on hand for the two previous night games. But what a treat for baseball fans whether in the TD Ameritrade Park or watching from their living rooms via the magic of ESPN! Coastal relied on three pitchers throughout the nine innings to throw strikes that left the Arizona Wildcats stranded on bases when the chips were down. An unexpected bonus was a young man named G.K. Young, a local boy from the little town of Conway down the road from the Coastal campus, who hit a two-run homer that made the final score 4 – 3. The game was a barn-burner, as my daddy would have called it. 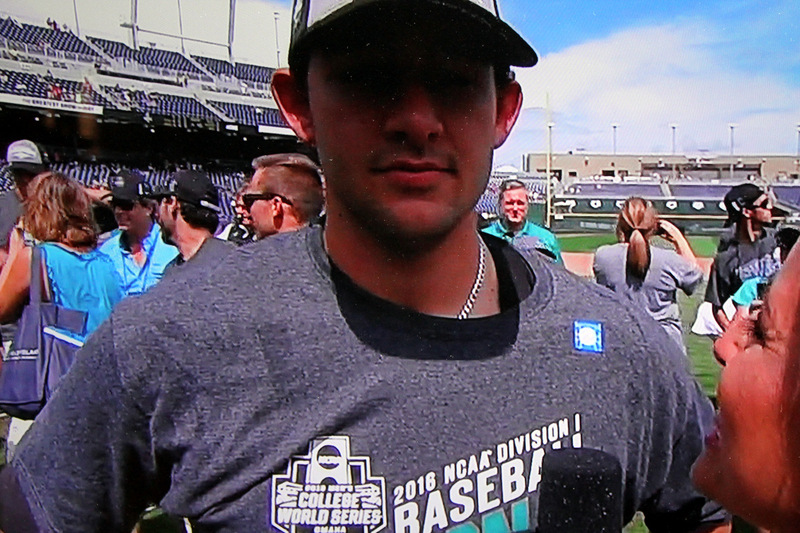 During a post-game interview with the slugger, G. K. Young said he had dreamed of one day hitting a game-winning home run but that hitting one in the College World Series was more than a dream come true. As for Coach Gilmore, his tears of joy spoke for him. Twenty-one years of keeping on keeping on and believing in himself and his program, his coaches and his players…big dreams of one day taking a team to Omaha and playing in the World Series had already been fulfilled. But to actually win…unbelievable…a miracle. His only regret was that his father wasn’t there to share the moment with him. His father had died two years earlier, and the coach pointed skyward as he said he knew his father was watching. When the team returned home the next day, more than 8,000 people greeted them as the conquering heroes, and Coach Gilmore again was near tears. “I came here twenty-one years ago and spent the first six months in a trailer with no indoor plumbing”, he said. “And these guys behind me have made my dreams come true.” They also helped him be recognized as the national coach of the year. And so we say good-bye to the Coastal Carolina Chanticleers and to college baseball one more time. Theirs was a Cinderella story with a Hollywood ending. Thank goodness Wimbledon dreams are still alive for another week of drama and underdogs like Sam Querry who defeated Novak Djokovic, the #1 player in the world, move on to the next round. Casa de Canterbury will be tuned in. As the Fourth of July approaches, I am reminded of another group of unlikely young men who became heroes as they fought and won our independence to establish a great nation that continues to grant me life, liberty and my personal pursuit of happiness two hundred and forty years later. I am indebted to those early freedom fighters – flawed as we all are – who never lost faith in their dreams. This entry was posted in Humor, Lesbian Literary, Personal, sports and tagged 4th of July, Coastal Carolina Chanticleers, college world series, novak djokovic, sam querry, TD Ameritrade Park. Bookmark the permalink. 5 Responses to The Dreams Came True! Good column. Margaret was among the fans to welcome them home. The company she works for down here is one of the team’s sponsors. Way to go, Margaret!! I know everyone down around the coast was so excited for them – as we were up here in the midlands…Happy 4th., Bob! !